Stolon/Station WFRG-FM is a low-frequency radio station transmitting from inside Hunter’s Point South. 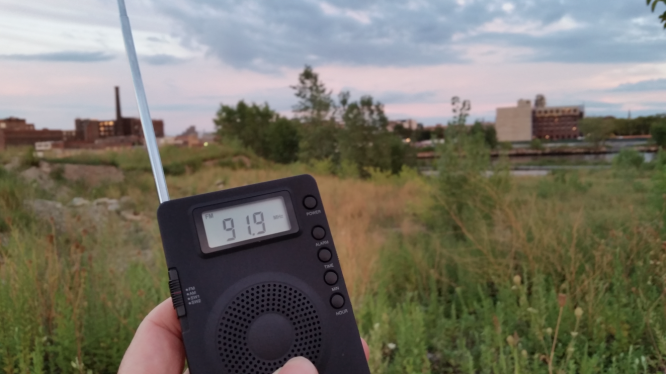 On Sunday, August 30, the station will broadcast a program consisting of field recordings taken inside the wilderness zone and sound works and readings by artists, ecologists, urban explorers, poets, and other Chance Ecologies contributors. Listeners – bird, plant, rock or human – are invited to tune in all day. Meeting Point: 4pm at the East River Ferry terminal at Hunter’s Point/LIC, for guidance onto site and frequency, or find us anytime between 4 – 8pm on site. At 4:30pm we will convene on the embankment by the old Pidgeon Street floatbridge for a listening party. Bring a portable radio, a blanket, and a picnic! Additionally, local boat clubs will be paddling out to the point to intercept the broadcast from the waves earlier in the afternoon. The number of boat participants is limited – please email chancecologies@gmail.com with subject title: “Stolon Paddle” to be put on a wait list for any open slots.